Wash very well raw spinach, drain and put in a pressure cooker with a glass of water and a little salt. Close and, as soon as it begins the hissing, put out the fire and put the closed pot under running cold water. Once the pressure, open the pot and drain spinach. Arrange them on a platter to the cold side first. Wring it out very well. Combine the pureed spinach with tofu, crumbled to margarine, cornstarch, nutmeg and a pinch of salt. Knead very well at the end should be creamy. Put pressure cooker the oil, onion and garlic; Let it FRY. Join the nut, the gravy, a little water and some Basil. Cook over low heat until the hissing, draining tortelli. Mix the flour with water and oil. Get her on the table, or use the machine to pull the sheets. Cut out the square of 6 × 6 cm. Put in the middle of each square a little dough. Close the dough into triangle, moisten the edges with a wet finger in water, put to use very well. To get the base angles of the triangle: take cappelletti and turning them down put to use between them. 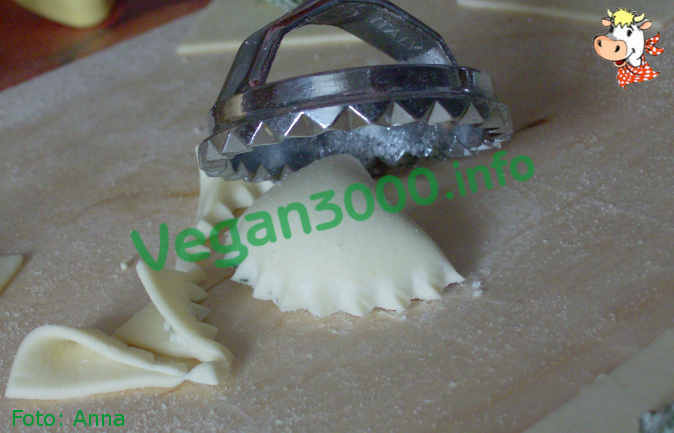 To get wonton: with a serrated pasta cutter press on excess of paste, eliminating the tips of the triangle. Bake in warm salt water to a boil, collect gently through a sieve after about two minutes, who moved up to the surface. Drizzle with the sauce simple and chilli, fresh basil leaves for garnish. Serve with fresh white wine.